There's apparently quite a lot of confidence in Peter Berg and Mark Wahlberg's action flick Mile 22, because STXFilms is already pushing ahead on a sequel. THR reports writer Umair Aleem, who wrote the Black List script Kate, has been hired to write the followup to Mile 22. Mile 23, I guess? Every time I see the trailer for Mile 22 I get a little bit pumped. It has little to do with Wahlberg but his supporting cast that includes The Raid's Iko Uwais, WWE superstar and ex-UFC champ Ronda Rousey, The Walking Dead's Lauren Cohan, and John Malkovich. Wahlberg leads a covert team of elite CIA operatives who must transport and protect a high-value asset as the enemy closes in. This was always planned as a multiplatform franchise, although nothing on a big screen sequel had been nailed down before now. 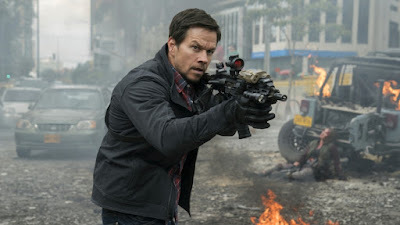 Next up for the title is a VR project known as The Kiev Exchange, in which Wahlberg's team attempt to negotiatea tense hostage exchange in a public square. Miles 22 opens August 17th, having been pushed back from its original August 3rd release date.